The Canadian health sector is an intersection of economic and political priorities. This industry is on the verge of significant change due to pressure for a more sustainable, cost-effective, and integrated system across all provinces and territories. As the industry changes and adapts, our health leaders need to change and adapt as well. Physicians like Dr. Amir Sheik-Yousouf, who specializes in internal medicine, are already ahead of the curve. Amir is on the verge of completing Rotman’s One-Year Executive MBA while maintaining his practice. One of the major challenges of our current healthcare system is a lack of communication and collaboration across organizations, regions, and other boundaries. Each province has its own approach to care, often duplicating the work put into other provincial systems. By learning how to step back and look at the full value chain, physicians like Amir can position themselves as innovative leaders, ready to ensure our system evolves to become more effective and cohesive. Rotman’s Global Executive MBA for Healthcare & the Life Sciences is designed to accelerate your career in a world of unprecedented health sector business and leadership opportunities. Applications are currently open for the inaugural 2018 class. This entry was posted in Executive MBA, Global Executive MBA for Healthcare and the Life Sciences and tagged Alumni, Current Students, Healthcare, In their own words, Theory in Practice, Tips & Advice, Working Professionals on November 14, 2017 by Rotman ME-MBA & MFin. The Master of Finance (MFin) program at the Rotman School of Management strives for strong connections with our alumni network. Not only do we think it’s important to see how our former students are doing – we believe in paying it forward. In this second blog post of our series, Where are they now?, we checked in with Yasir Mallick, MFin ’11, CPA, Director, Manager Selection and Portfolio Construction at the University of Toronto Asset Management Corp. (UTAM). Thank you for speaking with us, Yasir. Tell us what it means to you and your career to be an MFin alumnus. I applied for the MFin program after the 2008 financial crisis – I viewed it as a way to enhance my technical background given my work experience in the financial services sector. As an alumnus, I have definitely experienced direct educational and professional benefits from the program. Beyond these benefits, I am also proud of being an alumnus because I am part of a much broader community at the University of Toronto and at Rotman, a highly-regarded centre of knowledge in the Toronto financial community. It’s been a while since you graduated; is there anything you miss from the program? While I can’t say I miss attending classes and studying as a working professional, the program certainly reinforced my intellectual curiosity. During the program we were constantly exposed to interesting academic papers and empirical research that challenged our knowledge of finance. I have now replaced the intellectual stimulation of class with the intellectual challenges I face in my day to day role at UTAM. Did the program give you a new appreciation for different area(s) of finance? There were actually two areas: risk management and long-term portfolio management. These courses have provided a great foundation for my work ever since I graduated. I draw on this material daily to better understand new complexities and to execute my job. Aside from that, what would you say have been the immediate impacts from completing your degree? In my last year of the program, I was trying to make a career transition and I’d say that completing the MFin was critical in helping me achieve this goal. Not only did the program give me the necessary knowledge and technical skills to become a strong candidate for jobs in the industry, but it also gave me the confidence to apply to a more executive role in the pension fund management industry. I knew that, without the MFin, I would have likely been screened out by recruiters. I believe that, often, all you need is that first opportunity to meet with the hiring manager, and the MFin allowed me to get my foot in the door. How are you involved with the MFin community as an alumnus? How do you foresee getting involved moving forward? I’m still in touch with various professors, as I often connect with them when I see they have published new work in my area of interest. In fact, there’s a chance that I may be a guest lecturer for Rotman in the future. In terms of the student body, I have also met with many prospective or current students to share my insights or tips as they consider their choices in the program and in their careers. I plan to continue my involvement in this capacity, as I believe it is important to share our experiences and help others. Whatever course you choose to take, make sure that you are truly engaged with the material and passionate about it. As a working professional and part-time student you are pushing yourself to learn and work very hard. To keep yourself motivated, it’s important that you find the material useful and intellectually stimulating. On a more professional note, I certainly think that it’s important to have a loose outline of what you want to do with your career. However, keep an open mind! Be aware that this outline may not resemble anything close to where you end up, which sometimes, can also be a great thing. Yasir Mallick, MFin ’11, CPA, has seen the benefits of being part of the MFin community. Since graduating 5 years ago he has been rewarded with two promotions and a job at a new organization. Intrigued by his career path? Visit our website or sign up to one of our admissions events and get ready to become part of the MFin community. This entry was posted in Careers, Master of Finance and tagged Alumni, CPA, Faculty, In their own words, Portfolio Management, Risk Management, Where are they now?, Working Professionals on November 22, 2016 by Eva. Rotman’s Annual Open House. Join us November 6, 2016. Rotman’s Open House 2016 – mark your calendars! Rotman’s Annual Open House takes place on Sunday, November 6, 2016. Check out all six of our Master’s programs to see which program is the right fit for you. It’s the perfect day! Attend an information session, sample a class, try your hand at a trading simulation, and meet current students and alumni. Don Tapscott, CEO of the Tapscott Group and one of the world’s leading authorities on the impact of technology. He is also an Adjunct Professor at the Rotman School of Management. 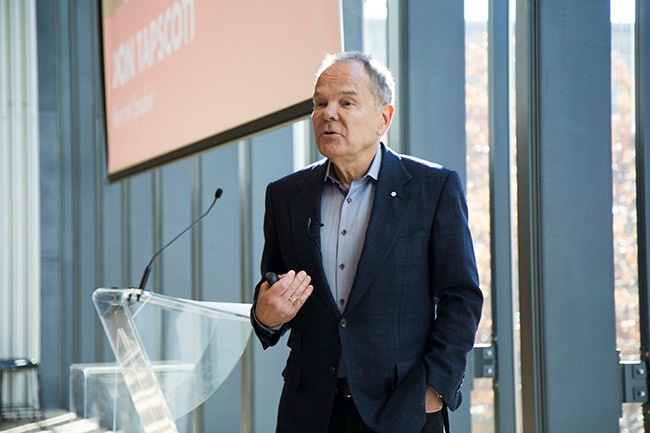 Our exciting keynote speaker is Don Tapscott, CEO of The Tapscott Group. He is one of the world’s leading authorities on the impact of technology on business and society. He has authored over 15 books including Wikinomics: How Mass Collaboration Changes Everything which has been translated into over 25 languages. In 2015, Don became a member of the Order of Canada, and was ranked the 4th most influential management thinker in the world by Thinkers50. He is an Adjunct Professor at the Rotman School of Management, an Associate of the Berkman Klein Center for Internet and Society at Harvard University, and Chancellor of Trent University in Ontario. Don is the Founder and Executive Director of the $4M Global Solution Networks investigation of multi-stakeholder models for global problem solving and governance. It is hard to imagine anyone who has been more prolific, profound, and influential in explaining today’s technological revolutions and their impact on the world. Register now to meet Don and our Master’s admissions teams on November 6, 2016 at Rotman’s Annual Open House. This entry was posted in Careers, Executive MBA, Global Executive MBA, Master of Finance, Morning & Evening MBA, Morning MBA and tagged Admissions, Alumni, Annual Open House, Events, Faculty, Networking, Open House, Powerful Network, Rotman Finance Lab, Sample Class, Toronto, Working Professionals on October 13, 2016 by Eva. What a busy couple of weeks at Rotman for our recently graduated Master of Finance class of 2016 and current MFin students! More than just in the classroom, our alumni, students, faculty and staff rubbed shoulders (and noisemakers) outside of school. On June 11, 2016, we had our third annual friendly soccer match with Schulich’s and Smith’s MFin classes. Trophy goes to Smith this year. Well played! The day after on June 12, we had our pre-convocation MFin reception where valedictorian Morgan Pampe gave a rousing and at times, emotional retrospective of the class over the past 20 months. Finally, the big day! On June 13, the MFin class of 2016 officially became Rotman alumni. This entry was posted in Beyond the Classroom, Master of Finance and tagged Alexandra MacKay, Alumni, Current Students, Events, Faculty, Fotini Tolias, John Hull, Powerful Network, Social, Toronto, Working Professionals on June 24, 2016 by Breanna. Congratulations to the Rotman Morning & Evening MBA Class of 2016 on convocation day! After 32 months of hard and rewarding work, our Rotman MBA class of 2016 is graduating today and ready to expand their impact globally. It’s the perfect day to reflect on the overall MBA experience. We spoke to Ciara Wakita, about her time in the Morning MBA for working professionals. Congratulations on your graduation, Ciara! You must be thrilled to have arrived to the finish line. Looking back do you remember why you chose to complete the Morning MBA at Rotman? Thank you. It has definitely been a fulfilling time of my life! When I decided to enrol in an MBA program, I knew that I would do it part-time. Taking time away from my career was simply not an option for me. I ended up choosing Rotman because of its reputation in the financial services sector and because U of T is an internationally renowned school. Once I chose Rotman, I had to decide between the morning or evening program. Because I wanted to keep an active social life and play sports in the evenings, waking up earlier two mornings a week made my days hyper-productive. After my 7 to 9 am class, I would still be able to get to work in time and put in a full day. What would you say is your favourite aspect of the program? I’d say it’s the camaraderie of the entire Rotman community. While you make a natural bond with people in your cohort in the first half of the program, I also made friends when I went into my electives in the second half of the program. I met amazing people from other cohorts. I didn’t the camaraderie, but there is just a very common understanding amongst everyone. Did you develop a strong network with your friends and faculty during the program? How was this beneficial? Yes. I feel that when you are in the program, you become part of a league of professionals who all have a common understanding about what you know. You are surrounded by super smart and overachieving people and it’s cool to talk about ideas. I have three close friends in the program who are what I call my ‘board of directors’. When I need to make a professional (or personal) decision, I go to them for guidance. How has attending the Rotman school and completing the Morning MBA impacted your career so far? Almost everyone in my cohort switched either jobs or roles while in the program. Even I switched roles within the same company. Just by being part of the program you become a hotter commodity in the labour market. What piece of advice could you give new incoming students and prospects for the Morning MBA at Rotman? Do things your way. There are so many events and clubs at Rotman, it can be overwhelming at first! Don’t feel like you need to do everything. Join clubs and events that matter to you; be selective. Personally, I didn’t get involved in student life as much as others. I don’t feel that I missed out on anything. I did what worked for me. Congratulations again and thank you for your reflections, Ciara! If you’re interested to learn more about the Morning MBA, contact us, visit our website or sign up for an admissions event. We’d love to hear from you. This entry was posted in Morning & Evening MBA and tagged Alumni, Current Students, In their own words, Networking, Part-Time MBA, Powerful Network, Tips & Advice, Women, Working Professionals on June 13, 2016 by Eva. Today is convocation day for the Rotman Master of Finance Class of 2016! Congratulations. Our newly graduated Rotman MFin Class of 2016 is now armed with a new way to think about finance and management that will transform their careers as finance leaders. Morgan Pampe, MFin ’16, CFA is the class of 2016’s valedictorian. He was drawn to the program for career reasons. What came as a welcome surprise was the wealth of experiences that Rotman makes possible: the professors, the case competitions, the speaker series, and most of all, the friendships. Here is a conversation we recently had with him. How does it feel to be finally done? It’s nice to have a lot more free time. And since the weather has improved, it’s doubly uplifting. However, I do miss coming back to Rotman because I made so many great friends here. Something people don’t appreciate or understand about the Master of Finance program is the closeness of the friendships you form here. As the program is so intensive, you end up spending a lot of your free time at the School, working on challenges together. It’s like when you’re younger and you’re doing everything together at the cabin, or going on a canoe trip. I really enjoyed that aspect, because I was a camper and I like that idea of closely bonding with people. That was something you didn’t expect. Like most people, I was drawn to the program for career reasons. With regards to that, it was the right choice. But I had no idea of how much I’d like everyone in class. There are people from all sorts of different backgrounds, in terms of the country they’re from, or their professional experience or education. You get great perspective on many different things. You’re all going through the same process of working and doing school, so there’s a lot of empathy. People are smart and ambitious, and there’s also a sense that we’re all in it together. Aside from the friendships you made, what’s the biggest take away from your experience? I couldn’t imagine how smart the professors would be. I’d learn something in, let’s say, John Hull’s or Peter Christoffersen’s class, and the next day I would be doing it at work and showing people. I would get some blank stares or head nods, and they’d be, “That’s good. We’ve never done that before. Keep doing that.” I got to see how worthwhile the program is in real time. Coming out as a graduate, you feel confident in talking to anybody about their job or their line of business. If you don’t understand it, you know how to find out. The program gives you the tools and confidence to dig deeper. If you were to talk to someone just entering the program, what advice would you give? I would point out that Rotman has so much to offer. The professors are great. There’s a wonderful stream of smart people and ideas and knowledge that flow through here. There’s an incredible speaker series that brings in heads of state, professionals and industry leaders to come and share their ideas. There’s an incredible alumni network, and always someone willing to sit down and talk to you. That said, the opportunity is fleeting. Time is passing. It’s up to you to have the discipline to constantly try to get as much out of it as possible. It’s like a wet towel and you need to just squeeze as much as you can out. How hard you’re willing to do that is in your hands. Edited. Full conversation with Morgan can be found here. Are you interested in investing in your career with the Rotman MFin? Contact us or visit our website for more information. We’d love to hear from you. This entry was posted in Master of Finance and tagged Alumni, CFA, Convocation, Current Students, Events, Faculty, In their own words, John Hull, Peter Christoffersen, Powerful Network, Toronto, Working Professionals on June 13, 2016 by Breanna. A fun night of connecting with Rotman classmates and friends (and winning a lot, apparently)! Master of Finance students at Charity Casino Night left to right: Jose Rivas, Wentao Jiang, Srijan Agrawal, Fotini Tolias (MFin Academic Director), Michael Kristanto, Tony Zhuang, Tracy Chong, Christina Alexander, Chi Woong Hoh, Emile Givogue, Morgan Pampe. A network for life: that’s one of irreplaceable benefits that you can expect from being at the Rotman School of Management, University of Toronto. Classmates become lifelong friends who become the network that you can rely on throughout your career. This March, the Graduate Business Council launched the inaugural Charity Casino Night, modelled after the Master of Finance program‘s traditional event. This year’s event brought together students, alumni, faculty and staff from all of the Rotman School’s master’s programs for a lively evening of fun, connection and raising proceeds for four charity partners. Remember that when choosing a graduate program, it’s also important to think about the community that will surround you. In the end, it’s this network that will make all the difference. For more sneak peeks into some of our great events, keep reading our blog or visit our website. This entry was posted in Beyond the Classroom, Master of Finance, Morning & Evening MBA, Morning MBA and tagged Alumni, Current Students, Events, Faculty, Fotini Tolias, Powerful Network, Social, Working Professionals on March 28, 2016 by Rotman ME-MBA & MFin. Passionate about a career in finance? This program is designed for you. Passionate about finance and accelerating your career? The Master of Finance at the Rotman School of Management may be the perfect program for you. In our latest video, world renowned Professors of Finance John Hull and Peter Christoffersen give compelling reasons why this program will enrich your professional life. The Rotman Master of Finance is designed for students who are already working in the financial industry. “The Rotman Master of Finance offers a deep focus on a broad set of finance topics, where the CFA is quite centered on money management. The learning style is very different as well,” says Lindsay Sinclair, CFA, an MFin alumna and Vice-President, Rates Sales at RBC Capital Markets. The depth and breadth of our curriculum will give you the finance fluency to make direct impact in your boardroom and your career. First, by studying at the top finance school in Canada, you’ll have access to state of the art resources such as our finance lab and to world-class finance faculty strongly connected to industry. Often, the best schools will have ties with industry, creating a reciprocal feed of input and ideas. This is the case with Stanford and Silicon Valley, and it is also the case with Rotman and the financial industry in Toronto. Second, this program only admits one cohort per year, which means that you’ll be taking courses with the same people and at the same time. This will allow you to build strong professional and personal relationships that will continue well beyond the duration of the program. At Rotman we have a highly active and engaged Master of Finance alumni network, often participating in events together with our current students. In this community you’ll share study notes, tips and advice and you’ll be able to grow together as professionals by sharing ideas and challenging each other to think. There is simply no question that this program can help you achieve your goal to become a future finance leader. Want to learn more about the program? Contact us or attend one of our upcoming events. This entry was posted in Master of Finance and tagged Alumni, CFA, Current Students, Events, Master of Finance, Networking, Rotman Finance Lab, Tips & Advice, Working Professionals on January 21, 2016 by Rotman ME-MBA & MFin. Rotman’s annual Open House on Saturday, October 17, 2015 was an energizing success! It is the Rotman School of Management’s biggest annual recruiting event where prospective students can get a feel of the quality of education at U of T, and also get a chance to chat with current students, alumni, faculty and recruiting and admissions staff to see which master’s program is the right fit. Rotman Morning & Evening MBA students, alumni and staff ready to greet our Open House visitors. 6 programs were on showcase including the Morning & Evening MBA and Master of Finance for working professionals, plus our newest graduate program, Master of Financial Risk Management. The school was already buzzing at the earliest part of the Open House during our Programs Fair. Student ambassadors, alumni and staff from each of the programs were on hand to give perspective and information. Prospective students also had a chance to tour the Rotman building. Michael Hyatt on the set of Next Gen Den. Michael Hyatt, our keynote from the Next Gen Den, immediately followed with a dynamic presentation on Opportunity. 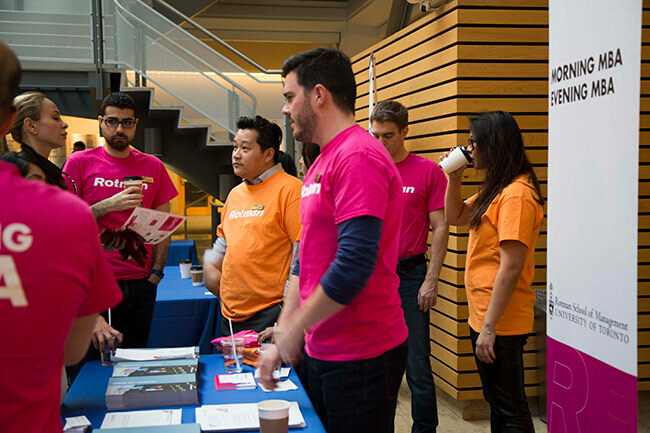 The main events of Rotman’s annual Open House took place thereafter. 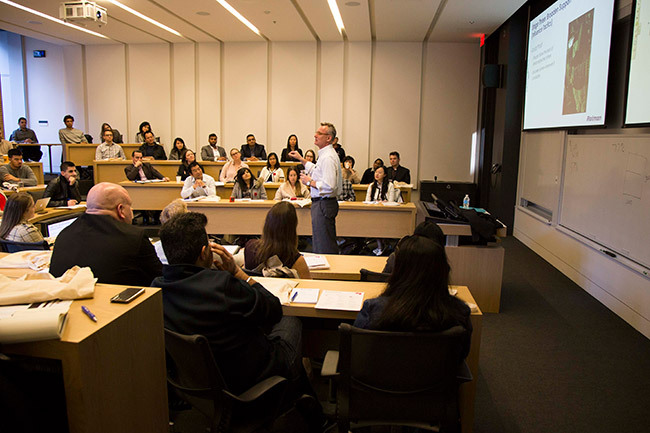 There were information sessions on each of the master’s programs; sample classes like Professor Peter Christoffersen‘s class on New Techniques for Managing Market Risk; Professor Glen Whyte‘s case study illustrating Effective Negotiating ; round table discussions on women in business, and more sessions that truly gave a flavour of all that is available to students of the Rotman School of Management. If you missed the Open House, there are still opportunities for you to connect with our admissions staff, and to find our more about the programs that interest you. Visit our website and keep an eye out for our next Morning & Evening MBA and Master of Finance admission events. We look forward to meeting you at one of our upcoming events! This entry was posted in Master of Finance, Morning & Evening MBA, Morning MBA and tagged Admissions, Alumni, Current Students, Events, Faculty, Open House, Part-Time MBA, Powerful Network, Rotman Finance Lab, Working Professionals on October 21, 2015 by Rotman ME-MBA & MFin. Rotman’s Annual Open House. Join us October 17, 2015. Rotman’s Annual Open House is fast approaching! Come explore what Rotman has to offer by attending an information session, sampling a class, trying out our BMO Financial Group Finance and Trading Lab, and meeting current students and alumni. Make the most of it by planning your day in advance using the online schedule. Latest news! Our keynote speaker is Michael Hyatt. He became a self-made millionaire at just 25, when he built two highly successful tech firms valued in the hundreds of millions. Today, he ranks as one of Canada’s top entrepreneurs, is a celebrated “Dragon” on CBC’s new online sensation Next Gen Den, and is a weekly Business Commentator on CBC News Network. Michael is also a Founding Partner at the Rotman School of Management Creative Destruction Lab, and on the CEO Board of Advisors at Georgian Partners. He is a finalist in Ernst & Young’s Entrepreneur of the Year Award, a recipient of the Top 40 Under 40™ Award and chairs his family’s charitable foundation. Our Master’s admissions teams will be in attendance and available to answer any questions about our programs, the School, and application processes. Register now and we’ll see you on October 17 at Rotman’s Annual Open House. This entry was posted in Careers, Master of Finance, Morning & Evening MBA, Morning MBA and tagged Admissions, Alumni, Current Students, Events, Faculty, Info Session, Michael Hyatt, Networking, Open House, Part-Time MBA, Rotman Finance Lab, Sample Class, Women, Working Professionals on October 7, 2015 by Rotman ME-MBA & MFin. On-the-ground update: Team Attollo has landed in Hyderabad, India and is in the midst of actively field testing their Talking Stickers concept that involves a small hand-held device. Piloting Talking Stickers concept in Hyderabad, India. The ultimate goal of Attollo Social Enterprise is to improve the vocabulary and communication skills for children in underdeveloped areas around the world. They won the Hult Prize regional finals in Dubai in March with their Talking Stickers idea, and the U of T quarter finals previous to that. Today, they are field testing their concept and preparing for the finals in September that would result in US $1 million to the winning team. The Hult Prize is a competition designed to help launch the ‘most compelling social business ideas’ and to ‘solve the world’s toughest challenges’. Lak Chinta, one of the four co-founders of Attollo dropped us a few lines yesterday to share their progress so far. “We are into day five of our field tests. We are finally getting to see progress of parents from urban slums learning with the device, and are engaging children curious to scan and playback sounds. It’s very encouraging. Parents engaging in field tests for Talking Stickers in Hyderabad, India. Children interacting with Talking Stickers during field tests in Hyderabad, India. “We will be meeting last year’s Hult Prize winner NanoHealth this afternoon to understand their slum operations and to observe the community in the same city. Chinta, his colleagues Jamie Austin, Aisha Bukhari and Peter Cinat met as students while studying in the Rotman Morning MBA program for working professionals. We’re so proud of their social innovation and dedication to improving the lives of children in impoverished communities. We’ll definitely be keeping an eye out for their updates, and cheering them on as they continue their field tests in Hyderabad and in Mombasa, Kenya later this summer. All photos courtesy of Attollo Social Enterprise. Follow their progress on Twitter. This entry was posted in Beyond the Classroom, Careers, Morning & Evening MBA, Morning MBA and tagged Alumni, Entrepreneurship, Hult Prize, Part-Time MBA, Powerful Network, Working Professionals on July 3, 2015 by Rotman ME-MBA & MFin. Rotman Master of Finance Soccer Champions (Again)! Last year, Rotman Master of Finance students and alumni won the inaugural friendly GTA MFin soccer match. On Sunday, June 14, at Glendon College, we repeated our success! In the first game, we beat Queens 1:0 and, in the final game, we won 4:1 against York. We are the champions for the second time in a row! Congratulations and thanks to all for a fun and energetic day! This entry was posted in Beyond the Classroom, Master of Finance, Student Life and tagged Alumni, Current Students, Events, Powerful Network, Social on July 2, 2015 by Rotman ME-MBA & MFin. Congratulations Class of 2015! Our Recruitment & Admissions team congratulate you on your hard work over the past 2-3 years. You’ve juggled countless assignments and multiple priorities in your home and work life, all for this moment. We hope that our part-time programs have allowed you to pursue your career aspirations without sacrificing your daily responsibilities. We are certain that you will continue to inspire and lead in the workforce just as you have done during your time at Rotman. We can’t wait to see what successes the future will bring you! This entry was posted in Beyond the Classroom, Master of Finance and tagged Alumni, Events, Powerful Network, Working Professionals on June 17, 2015 by Rotman ME-MBA & MFin. Thaksa Sethukavalan, CPA, CA, Auditor, Office of the Auditor General of Ontario. Rotman MFin candidate and Master of Finance Women’s Excellence Entrance Award Recipient. We’re now deep into building our Master of Finance 2017 class. The calibre of applicants are impressive professionally and are remarkable in the clarity of their drive to succeed. In this blog post, we’re highlighting another recipient of the Master of Finance Women’s Excellence Entrance Award. Congratulations to Thaksa Sethukavalan, CPA, CA who will start the program this September. How did you hear about the Rotman MFin? Before applying to the MFin program, I had spent several months researching graduate business programs in Toronto. I had been feeling the itch to go back to school for some time by that point, but I wasn’t initially sure which graduate degree was right for me. Originally, I was leaning towards an MBA, but through my research I came across the MFin program. It appealed to me a lot more as I read more and more about the program. Can you tell us a bit more about your professional background as you certainly are a unique candidate for the MFin program. My professional background is actually in accounting and audit. After university, I spent three years working at Deloitte LLP in its audit practice and earned my Chartered Accountant designation with the firm. My focus was on financial statement audits. I can honestly say that I learned a lot while I was there, and was able to work on a number of interesting and complex audit engagements. At present I work for the Auditor General of Ontario, where my focus is on value-for-money audits of the provincial government and its ministries. It is very interesting work! What is your favourite thing about finance? My favourite thing about finance is the fact that finance itself is such a broad and wide-ranging topic. There are so many different specializations or focus areas that an individual could choose to get into or pursue, based on their own personal interests. I love the fact that you can never really be done learning about finance – there is always something new that an individual can choose to understand. What made you decide to apply to the MFin? As a Chartered Accountant, I’m always looking for ways to differentiate myself from my peers. With the recent merger of all the Canadian accounting designations into the CPA designation, I really felt like I needed a graduate degree to help set myself apart from other CPAs and to move into more upper management type roles. I’ve also always had an interest in finance in particular, and having already come from an accounting and audit background, it made more sense for me to complete a Master of Finance degree over an MBA. I also enjoy challenges and truly love to learn – I really felt as though the Master of Finance degree would help me become a better, stronger and more well-rounded business professional than any other type of graduate degree. Did you attend any MFin events that helped you to make your decision? I was fortunate to attend quite a few MFin events that helped me make my decision. The Rotman information session was able to provide me with some background information on the program, the curriculum and the workload involved with the MFin degree. There were some past and current students that attended the event and I was able to speak to them about their experiences with the program. I was also able to attend some Rotman networking events (the MFin market simulation sample class as well as the TD & Rotman Women @ Work Symposium) which really gave me a good feel for the culture and network at Rotman. I was also fortunate enough to be able to sit in on a Wednesday evening class and speak to some current students who spoke highly of the program, which also helped me make my decision to pursue an MFin degree. Additionally, Alexandra MacKay, the Academic Director of the Master of Finance program, was kind enough to put me in contact with several Chartered Accountants who had already completed the program or were in the process of completing it. All of them had very good things to say about the program, the material and courses, as well as the quality of professors that taught in the program. They all told me it was a very challenging program, but well worth their time and effort, which is something that really resonated with me. What made you decide to accept your offer of admission? For me, there were several factors that helped guide me to accept my Rotman MFin offer. First and foremost, having sat in an MFin class and having spoken to several past and current students, I was really impressed by the material being taught and what past and current students had to say about the program. No matter who I spoke to, everyone spoke highly about the program, the curriculum and the professors, which really impressed me. I was also impressed by the close-knit network at Rotman and the high calibre of graduates from the program. Everyone I spoke to was really eager to help answer my questions about the program, which was very appealing to me. I decided that I want to a part of this community. Also, being awarded with the Master of Finance Women’s Excellence Scholarship was a very pleasant surprise and helped seal the deal. Do you have any advice for students thinking of applying to the MFin program? The only piece of advice I would have to give is to do your research. The MFin is an incredible program, but it’s really important to make an assessment as to whether the program is the right fit for you at your stage in your career. I recommend attending information sessions and Rotman networking sessions to see if you could benefit from the program. I also recommend getting in touch with MFin alumni and current students and talking to them about how they found the program. Doing this will help ensure you make an informed decision about pursuing an MFin degree. Final question: what are you most looking forward to in the program? Other than bettering my understanding of finance, I am really looking forward to meeting and networking with my future classmates. I have heard great things about the calibre of students that are admitted into the program, so I look forward to learning and working with them. Our next Rotman Master of Finance application deadline to start September 2015 is fast approaching on April 1, 2015. If you have any questions about the program or the application, please contact us. We would be pleased to help. This entry was posted in Master of Finance and tagged Admissions, Alexandra MacKay, Alumni, Application Deadlines, CA, CPA, Current Students, Entrance Awards, In their own words, Powerful Network, Rotman Finance Lab, Tips & Advice, Women, Working Professionals on March 25, 2015 by Breanna. For the second year in a row, a Rotman MFin team won the CFA Master of Finance Ethics Challenge. Congratulations to the Rotman MFin team of Roger Brown, Mahtab Faruqui, Sheng Fei and Michael Szaura! Left to right: Rotman winners of 2015 CFA Master of Finance Ethics Challenge Michael Szaura, Sheng Fei, Mahtab Faruqui and Roger Brown. Planted last year as a result of a conversations between the Rotman, Schulich and Queen’s Master of Finance programs, the 2015 second annual ethics challenge saw MFin teams from the three schools again competing for top honours. Sheng continues, “All my team members signed up immediately after I pitched the case competition. All of us believe strongly in the value of ethics education, and the importance of promoting the highest ethical standards in the investment profession. As financial professionals we are faced with ethical dilemmas on a daily basis and this competition helped us sharpen our tool kit to analyze and resolve ethical situations effectively. We’re delighted with the team’s win and are looking forward to next year’s challenge. If you’re interested to learn more about the Rotman Master of Finance program, visit our website at www.rotman.utoronto.ca/MFin. Contact us for more information or to start your MFin September 2015. You may also contact Breanna Brooks, Assistant Director of Admissions directly. We would love to meet with you! This entry was posted in Beyond the Classroom, Master of Finance and tagged Alumni, Case Competitions, CFA, Current Students, Events, In their own words, Powerful Network, Toronto, Working Professionals on January 19, 2015 by Rotman ME-MBA & MFin. It is with great pride that we congratulate our Hult Prize at U of T quarterfinal winners. Team Attollo is made up of current Rotman Morning MBA students and an alumnus: Lak Chinta, Aisha Bukhari and Peter Cinat. The three students will now go on to represent U of T at the Regional Finals in March 2015. The winners of the regional will compete for US$1 million in funding to start-up their social enterprise. It’s not the first time this team has worked and won a competition together. In 2013, they won the $100,000 to prize in the Manulife Entry to Asia Challenge. Their personal accomplishments are impressive and each member brings his or her own passion and experience for a winning combination. Lak has a PhD in Neuroscience with over 12 years’ experience in research, engineering, healthcare, entrepreneurship and direct experience from living and working with urban slums communities in India. Peter comes from a computer engineering background with over 11 years of experience working on strategic problems in the technology space with global clients. Aisha has her Masters in Engineering, expertise developing innovative solutions in the energy sector and brings her public-sector experience to the team. For more details about their win and an interview with Peter, visit this U of T news article. Good luck to an outstanding team. We’re very proud of your accomplishments. This entry was posted in Beyond the Classroom, Morning & Evening MBA, Morning MBA and tagged Alumni, Case Competitions, Current Students, Entrepreneurship, Hult Prize, Innovation, Part-Time MBA, Powerful Network, Working Professionals on December 17, 2014 by Rotman ME-MBA & MFin. Every year, the Rotman Master of Finance program organizes the popular Rotman MFin Casino Night Mix and Mingle. It’s a fabulous opportunity for current MFin students, alumni, faculty and staff to meet together for a fun and casual night. Current students take the opportunity to meet their seniors, alumni touch base with friends made during their time at Rotman, and faculty mix and mingle with all. Check out photos from our last Rotman MFin Casino Night Mix and Mingle on Thursday, November 6, 2014. This entry was posted in Beyond the Classroom, Master of Finance, Student Life and tagged Alan White, Alexandra MacKay, Alumni, Current Students, Events, Faculty, Fotini Tolias, Heather-Anne Irwin, John Hull, Networking, Powerful Network, Social, Tom McCurdy, Toronto, Working Professionals on November 13, 2014 by Rotman ME-MBA & MFin. In the fourth and final installment of our wide-ranging conversation with Rotman Master of Finance class of 2014 alumna, Wen Lei, CFA, Manager, Asset and Liability Management at Manulife Financial, shares her thoughts about the friendships she formed, the calibre of her classmates and her final thoughts on the MFin program. Remember to check out part I, II and III of our conversations. Congratulations on graduating this June! Now that you’re no longer in the classroom together, do you still keep in touch with your fellow MFin alumni? Definitely. We still hang out. Recently, one of us sent an invitation to everyone for a poker night. So everyone’s still in contact. We went through the fire together so to speak, so there’s a kind of camaraderie there. The Rotman MFin classes are small as well so you’re able to talk to most of the people. It’s easier to make friends. In my class, it’s funny, most of the people sat in the same spot through the whole program. So on my left was Andre. On my right was Jim. We had a pretty good dynamic. I have to say that I learned a lot from both of them. Especially Andre. He really pushed me. How did he push you? He knew that I like to talk but that I’m not good at presentations or speaking in front of the class. We were in a career workshop with Heather-Anne Irwin. We had to do a one minute elevator speech, introduce yourself kind of thing. She asked for volunteers to come up and give a speech to the class. And Andre said, “Wen wants to go!” I didn’t want to go! I did alright. Afterwards I thought, if it wasn’t because he pushed me so hard, I wouldn’t have done it. That’s really great to hear. We always talk about how we have this powerful network. It’s great that it’s more than formal ‘networking for work’ – it’s also about gaining friendships. You really do help each other out. Yes. Like Jim, he’s in a very senior position in a bank. Last year I set myself a goal to do something out of my comfort zone. So I booked informal meetings with some of the portfolio managers or senior VPs in Manulife. I would ask Jim for advice about what kind of questions I should ask, what I should talk about. He’s in that position. So I assumed he knew how I could make the most of my time with them. He helped me out, he talked to me about it. The outcome was pretty good. I have another example of the class helping each other out. In our class, we had a lot of babies. That is, at least five of the guys became new dads during the MFin program! After they had children, we understood that they may not have as much time as before to do assignments, so the other group members will take more on. We actually did it without talking about it. Clearly, the relationships you’ve built in the MFin program really means a lot to you. Is there anything else that stood out to you about the program? People do ask me about the MFin program, and I always tell them that there are three major benefits you can get from the MFin. One, you get the best professors in finance in Canada. They’re not just the best, they’re approachable. If you have questions, they never delay replying to your emails. You can always reach them. A few of my teachers are women who are also in the industry. They really inspired me. My classmates were also very inspiring. I truly appreciated the calibre of the class. My peers come from all areas in the finance field. In our class we had traders, sales, risk management and accounting. I‘m more like asset management and accounting. For people who are relatively new to the field and are reevaluating what to do with their career, you can get a lot of advice. You can talk to a lot of people and see what each job is like. Plus, not only do you meet people, you make friends. And those are life time friends actually. The third benefit that I tell people is that you definitely learn a lot from the program. It’s much deeper than the CFA. I actually applied a lot of the theories from the risk management and portfolio management courses in my work right away. For example, I was able to apply the maple bond concepts that we learned in our applied fixed income class immediately. At the time, I was working with Canadian portfolio management. We were considering issuing long term treasury because there was a lot of demand for it. I talked to Fotini (Tolias) about it and she actually helped me with the proposal I made. Now, sometimes my manager at work will come to me with questions. One of two Rotman MFin finalist teams of the 2013 National Investment Banking Competition in Vancouver. (L-R) Raymond Lam, Wen Lei, Iffat Kashif, Jiten Mistry. The curriculum really is practical and so on point. Portfolio management was an awesome class. One of my class group mates is a trader at BMO and we talked about trading ideas. I started a trading account, and started managing my parents’ pension fund. I started last June; year-to-date, I have a return of 25%. My group’s balanced fund was the top performer and we received an award for that. Thank you so much for all your insight into your time here at Rotman! This entry was posted in Master of Finance and tagged Alumni, Faculty, Fotini Tolias, Heather-Anne Irwin, In their own words, Powerful Network, Women, Working Professionals on October 27, 2014 by Rotman ME-MBA & MFin. What is it like to study part-time while working full-time in the finance industry? In part 3 of 4 of our wide-ranging conversation with Rotman Master of Finance alumna, Wen Lei, CFA, Manager, Asset and Liability Management at Manulife Financial, she shares her personal experiences with getting it all done. Remember to check out part I and II of our conversations. What’s the lifestyle for you as a woman in finance? It’s busy, I like it. A lot it is about your personality and what you want to do career-wise and in your personal life. For me, I feel anxious if I’m not doing anything. For example, this year, work was pretty heavy. I worked with Manulife Hong Kong and Japan, so I was always on calls at eight in the morning, eight o’clock at night. Then school in the last semester was crazy. I also had a wedding in May. In February, I completed my group fitness certificate as a personal trainer. If it wasn’t for exercise, I wouldn’t have energy for all those things. That’s a lot! Let’s talk about your strategy for juggling these different areas in your life. One of the big questions that people pose about part-time programs is how to balance, work, family and study at the same time. The thing is, I don’t think I’m the best student in class. My approach is to separate work and school. During the week, I focused on work. Some people have time here and there to do assignments and stuff. But because of my work schedule, I’m constantly working overtime. The 8AM/8PM calls mean that I wouldn’t have time during the week to do assignments unless I really had to. I devote my time 100% to school on the weekends. I’m always kind of playing catch up. We have class on Wednesday nights, Saturdays, and sometimes Saturday and Sunday. I definitely devote those days mostly to assignment and readings. I make sure that I get whatever I need done, done. I’m not a super woman either, so I can’t do everything at once. You have to give up something. So I had to see my friends less frequently. I didn’t really go out all that much during my studies. The only time I really go out is after class on Saturday. I’ll go out for a drink with friends or classmates. And I’ll make sure I don’t over indulge to the point where I have a hangover the next day because that would waste my whole day. You really have to be disciplined. During the MFin program, I got a lot of support. My family, my husband. And also classmates. They’re your motivators. [Laughs] For my wedding, I was able to push much of it to my husband. He did a lot. So it sounds like you really have to be dedicated to achieving what you want – and studying while working full-time is possible. Well, for the Rotman MFin program, it’s part-time, so the school understands you’re not going to be 100% at school. The curriculum is structured in a way so that all the work is very doable. The thing is, you’re paying good money for your education and advancement. It all depends on what you want out of this program. I’m sure some people may just go through the motions or even miss classes. You paid for this. You should definitely get as much out it as possible. Contact us for more information or to start your MFin this September. This time next year you’ll be half way towards achieving your degree. You may also contact Fiona Duley, Assistant Director of Admissions directly. We would love to meet with you! This entry was posted in Careers, Master of Finance, Student Life and tagged Alumni, In their own words, Tips & Advice, Women, Working Professionals on August 21, 2014 by Rotman ME-MBA & MFin. How is the Rotman Master of Finance (MFin) different from the CFA? How is the Rotman Master of Finance (MFin) different from the Chartered Financial Analyst (CFA) designation? It’s a question that we are frequently asked by prospective students like yourself who are looking to accelerate your finance career with the Rotman Master of Finance. To answer this, we turned to one of our MFin alumna to get her perspective in her own words. What those seriously looking into the program should know is that the Rotman MFin curriculum supplements and extends beyond that of CFA and other professional finance designations. Typically 50% of our class has at minimum passed the CFA level I examination. The Rotman MFin is a program that’s designed to help you to become a future finance leader. The breadth and depth of finance knowledge that Ms. Sinclair mentions above translates into an ability to master the diverse languages of finance – from risk management, fixed income, investments to corporate finance. You’ll also have access to world-renowned faculty such as Professor John Hull, who is the world’s leading expert in derivatives, options and risk management. We recognize the dedication and foundational finance knowledge gained with a CFA designation, which is why the Rotman MFin program accepts your CFA level 3 exam passed in lieu of the Graduate Masters Admissions Test (GMAT). For those who have recently passed their CFA level 3 examination, congratulations again and we hope you’re ready for your next challenge with the Rotman MFin! Bonus: Did you know that the Rotman MFin itself qualifies as a Continuing Education (CE) activity for CFA charter holders? 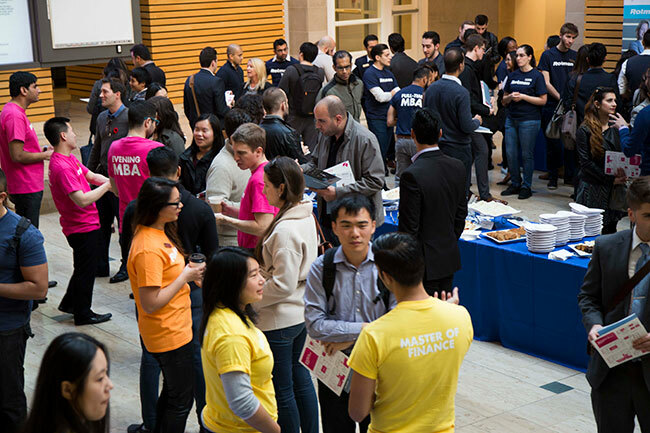 Talk to us if you have any questions about starting the Rotman Master of Finance. Our Master of Finance Assistant Director of Admissions, Emily Mancuso would love to hear from you! Simply fill out this contact form with your information. This entry was posted in Careers, Master of Finance and tagged Admissions, Alumni, CFA, GMAT, In their own words, Networking, Women, Working Professionals on August 18, 2014 by Rotman ME-MBA & MFin. Have a peek at what one alumna’s journey to the Rotman Master of Finance was like. We sat down with Wen Lei, CFA, Manager, Asset and Liability Management at Manulife Financial and recent Rotman MFin alumna for a wide-ranging conversation on her career, influences and the Rotman MFin program. This post is the second in a four-part series. Check out her first post and stay tuned for the following posts! How did you find about the Rotman MFin? You finished your undergrad in 2006 and started the MFin in 2012. What did you do in the 6 years in between? The first time that I heard about the MFin was in 2007 while I was working at CIBC in risk management. It’s actually also the year that the MFin program launched. I had 2 co-workers at CIBC in my department at the time who took the MFin, one of them in the inaugural year and the other the year after. At the time, I had just graduated from university, and was still in a junior role. I was taking my CFA, so I was hoping to finish that before pursuing a Master’s degree. I had already kind of planned out my career path; what I want to accomplish by what age. My goal was that by age 30, I have to finish all my formal schooling. Anyway, I worked at CIBC for a couple of years before I switched over to TD where I continued with my CFA. In terms of work, I did pretty well at TD. I was promoted directly to manager from analyst, so I didn’t have to go through the additional step of senior analyst. The opportunity at Manulife came along when as my former boss reached out to me. I thought it was a good move. So I took it. At the same time, I also became a CFA charter holder. That was when I looked seriously at doing either an MFin or an MBA. Yes, right away. I had that goal to finish everything before 30! My advice is for people to really know what they want and to take the steps to work towards it. What made you decide on the MFin vs an MBA? I was already a people manager – I had managed a staff of eight. I knew I wanted to be in finance. Like a lot of my peers in class, I wanted to learn something deeper specific to finance. The MFin was definitely the way to go for me. Also, I compared the three programs in the city. There are only 3 schools that offered the MFin in Toronto. One is geared towards people who wanted to finish their CFA program, another is a full-time program. And I looked at U of T. It does charge the most, but you got these fantastic, stellar professors. The Rotman MFin is part-time, has amazing professors, and the location is right where I needed to be. Classes are small, which is what I wanted. I had fun. I got to know a lot of smart people in class, which proved that I made the right choice. Apply to start your MFin this September. This time next year you’ll be half way towards achieving your degree. Merit based entrance awards are available. Contact us with any questions. This entry was posted in Master of Finance and tagged Alumni, In their own words, Women, Working Professionals on July 30, 2014 by Fiona. What is it like as a woman in finance? We caught up with Wen Lei, CFA, Manager, Asset and Liability Management at Manulife Financial and recent Rotman Master of Finance alumna for a wide-ranging conversation on her career, influences and the Rotman MFin program. This post is the first in a four part series. Stay tuned! How did you choose finance for your career? In my undergraduate studies, I had an excellent instructor, Karen Chiykowski. She was very influential in my finance career choice. Were you interested in finance before? No. I had no idea what I wanted to do exactly. Truthfully, I just thought that I wanted a business degree because of the job options. You had a few fields to choose from. More than half of the students went into accounting. I had no interest in accounting at all. I did quite terribly actually. I think it was my only C+. I hated it! I liked finance the best. Karen was really good. She motivated me and definitely kicked off my interest in the area. It’s not 100% just numbers; you have the quantitative and qualitative aspects at the same time. There are relatively few women in the finance industry. Thoughts? I don’t feel disadvantaged at all, especially in Toronto. My boss is a woman. I had a couple of women mentors. In school we had female professors, a lot of whom had also been practitioners in the industry. I think a lot of women go into other fields by choice. Traditionally, we might look at ourselves as better in literature, psychology, not necessarily in math nor science. What character do you need to succeed in finance? You have to be able to compete in finance. You have to be hard-working. You have to be driven. You have to be motivated all the time. Particularly in Toronto, we have more CFA charter holders than New York! Everyone works hard to get in to get a good job. You just have to be very assertive about yourself. Very self-motivated. Would you have any advice for women thinking about going to finance? Find yourself a mentor. Join some sort of organization. For example, Women in Capital Markets is very good. Having a good mentor is important. I mentor some people too. Right now, I’m in a formal mentorship through WCM as an “apprentice”. Actually, my mentor is also a Rotman MFin alumna who graduated in 2012. What value do you find in a mentor? I find women very supportive. Most mentors have more experience than you. For example, my mentor has been in the industry for more than 15 years. She has a pretty good career path. She did the Rotman MFin. You’ll find commonalities with your mentor. You’ll also learn about their career path, their experience, how they get to where they are right now. You learn from that. And, if you have issues or problems or questions, maybe they can help. Maybe they have had the same experience or puzzle before. They’ll help give you some kind of solution or insight that could be useful. Apply to start your MFin this September. This time next year you’ll be half way towards achieving your degree. Contact us with any questions. This entry was posted in Beyond the Classroom, Careers, Master of Finance and tagged Alumni, In their own words, Mentoring, Women, Working Professionals on July 24, 2014 by Fiona. From real estate finance to corporate credit and risk. Rotman Master of Finance alumna Miranda Fong shares how the MFin gave her the street credibility and competitive leverage to differentiate herself among a very competitive pool of candidates. The Rotman MFin program takes place over 20-months. Apply by August 15, 2014 to start your MFin this September. This time next year you’ll be half way towards achieving your degree. Merit based entrance awards are available. Contact us with any questions. This entry was posted in Master of Finance and tagged Alumni, In their own words, Women, Working Professionals on July 18, 2014 by Rotman ME-MBA & MFin. Time flies when you’re focused on your career, and having fun doing it. In a throwback Thursday kind of moment, 3 recent Rotman Master of Finance alumni, still students during filming, share their top reasons for pursuing the program. The Rotman MFin program takes place over 20-months. Apply by the August 15, 2014 deadline to start your MFin this September, and graduate by May 2016. Entrance awards are $5,000 – $20,000. Contact us with any questions. This entry was posted in Master of Finance and tagged Alumni, In their own words, Working Professionals on July 10, 2014 by Rotman ME-MBA & MFin.